What is the purpose of literary criticism? Among other things, to guide the reader past his or her resistance. Most art, subtly or aggressively, resists the familiar. Poetry in particular suffers from this resistance, because poets take the material that we depend on to operate in and make sense of the world (language), and bend it to other, often seemingly obscure, purposes. Readers, sophisticated and beginner, need critics to explain why and how poets are using language for these different purposes, and what those purposes might be. Our attachment to familiar language is powerful, and understandable. Without critics, we will hold on to the familiar and be unable to accept that there are other uses for language, that there is new and exciting poetry all around us. Critics can do one of at least two things. The first is simply to insist that something is good, or bad, and rely on the force of personality or reputation to convince people. The second is to write, with focus and clarity, about how the piece of art works, what choices the artist has made, and how that might affect a reader. Only then can the reader grow to meet work that is unfamiliar, that he or she does not yet have the capacity to love. My friend Kalpna Patel recently visited the village where her family is from in India, and she found that the high school her parents graduated from is in need of a few necessities, like shoes for some of the students, and she has devised a way to help. She has created The Pencil Project. 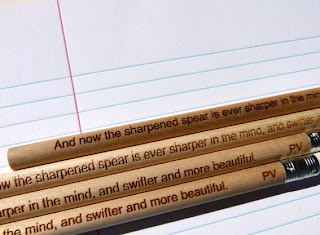 These pencils are engraved with lines by several Canadian writers, and I am proud to be one of them. Proceeds from the sale of these pencils will go directly to the school. I urge you to read all about it on Kalpna's blog. Every little bit helps. It's a wonderful project. Please support it. The Pencils are being unveiled today at the Queen West Art Crawl, which runs today and tomorrow in Trinity Bellwoods Park from 11-6. Go check it out!